The air-conditioned apartment features a seating area with a flat-screen cable TV, a fully equipped kitchen with a microwave and a mini refrigerator and a bathroom with a shower, a hairdryer and towels. Located in a quiet street 2 km from the Route 74, the City Center Apartman offers a self-catering apartment on the ground floor with free WiFi access and bicycle rental. The air-conditioned apartment features a seating area with a flat-screen cable TV. It comes with a fully equipped kitchen, including a microwave and a mini refrigerator, and a bathroom with a shower, a hairdryer and towels. Food provisions can be obtained in a grocery shop 50 metres from City Center Apartman and meals can be enjoyed in a restaurant 500 metres away. Zalaegerszeg AquaCity Thermal Bath can be reached in 10 minutes by car and the Göcsej Village Museum is 1 km away. Zalaegerszeg Vasútállomás‎‎ Train Station is 2 km from the apartment, and Zalaegerszeg Bus Station is 1 km away. Shuttle from and to the train and bus stations can be provided upon request for surcharge. FlyBalaton Airport is located 29 km from the property. Please note that the property has no reception. Please contact the property in advance for check-in arrangements. Contact details are stated in the booking confirmation. Please inform City Center Apartman in advance of your expected arrival time. You can use the Special Requests box when booking, or contact the property directly with the contact details provided in your confirmation. good value for money. after the misunderstanding we had he was totally fair. all was clean and good equipment. not far to the centre but a bit in a dark street, thanks god no gipsys around who are noisy and...neighbours very friendly who tried to help us (free!) when we could not enter the appartment. the only thing that nobody was there when we arrived and we had to wait 1,5 hours until he came. we did not believe any more. but it was a misunderstanding maybe. anyway, after that he gave as a bonus and apologized (dont know whose fault it was) and all was ok then!! maybe to mention yet only hungarian programmes in tv. Parkolás, de ez helyi adottság szinte mindenhol fizetős. Az időjárásról nem tehet a szállásadó sem. Klassz dizájn, kellemes lokáció, szelíd ár! 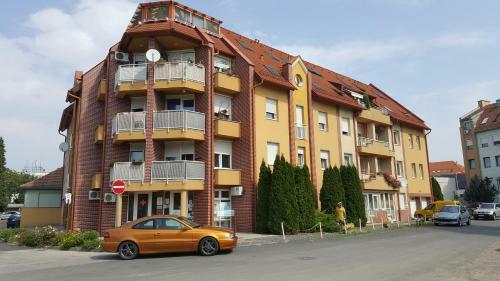 Rugalmas tulaj, klassz dizájn, full komfortos apartman - ha Zalaegerszegre megyek ezt fogom választani!